These Chippendale walnut (Juglans spp.) side chairs were all sold at the Fine Furniture, Silver Decorative Art and Clocks auction held at Bonhams’ New York branch in October 2015. The set of three chairs can possibly be attributed to Samuel Mickle and Jonathan Shoemaker and date from the third quarter of the 18th century. Two of the chairs have a rose-coloured silk velvet upholstery, the third has a dark blue silk velvet upholstery. Their original owner was John Estaugh Hopkins (1738–1812). 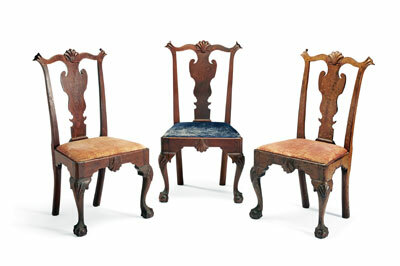 These three chairs are part of a larger set of chairs, two of which are currently in the collection of the American Museum in Bath. The museum has attributed their chairs to Jonathan Shoemaker and Samuel Mickle. While recent scholarship may disprove that attribution, Samuel Mickle (1746–1830) may have been distantly related to the Hopkins family as John Estaugh Hopkins’ wife was Sarah Mickle. Jonathan Shoemaker was a cabinetmaker in Philadelphia and Mickle was his apprentice. 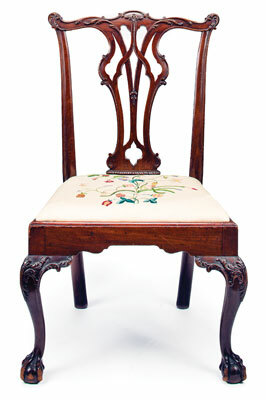 The single carved walnut side chair also dates from the late 18th century. A brass plaque to the back of the rear seat rail is inscribed: ‘This Chair belonged to Arthur Howell – born 8th mo. 20th 1748 and died 1st mo. 26th 1816’. Howell was a Quaker minister who lived in Philadelphia where he owned a leather store.